You've probably seen the posters dotted around about this Thursday's free talk. It follows directly on from our (very brief) AGM, starting at 7.30p.m. Now here's your personal copy - as a memory jogger! 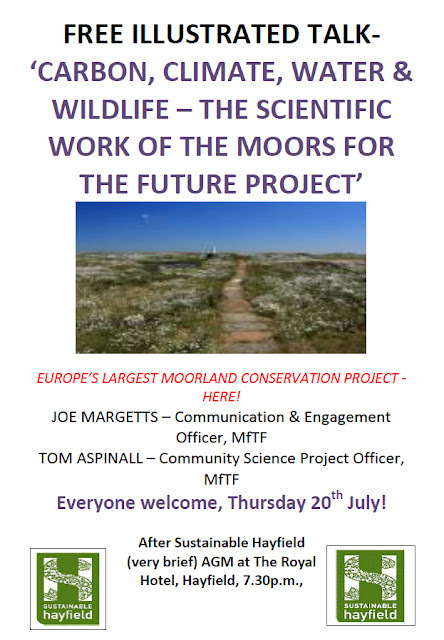 It should be a fascinating and inspiring evening as MfTF show how they are progressively 'greening' our local moors, managing down carbon emissions, reducing water run-off and flood risk and increasing species diversity, as part of Europe's largest moorland conservation project. We hope to see you there! Earlier that day, the project is running a 'Community Science' event for volunteers who want to help in identifying some of the mammalian wildlife found on and around the moors. The free training event runs from 1.30-4.30p.m. at New Mills Volunteer Centre, Union Road, New Mills. It will introduce Community Science's latest survey - 'Tails of the Uplands'. It will provide those attending with information on the ecology and field signs of otters, water voles and mink in order to help them, as volunteers, to perform field surveys to monitor their presence in and around the Peak District and South Pennines. The session is indoors and there'll be a chance to sign up for a further outdoor session at a later date. No prior experience is needed, just bring your enthusiasm! If you're interested, contact moorcitizens@peakdistrict.gov.uk. Thursday 13th July, 8.00p.m. at The Royal, our food group is meeting at The Royal. The meeting's open to all. If food's your thing, why not join in the discussion? Saturday 15th July, 11.00-1.00p.m., a Family Session at The Library Garden, when we'll be picking fruit - it belongs to all of us and it's hanging, ripe to be picked - for you to take home, and we'll have some minibeast hunting too, to spy out the diversity of the garden. A poster's attached - as a reminder! Thursday 20th July, Sustainable Hayfield AGM, 7.30p.m., The Royal Hotel. The agenda and notes of the last meeting are attached. If you're interested in what we get up to, come along: it will be very brief..........and is followed by our planned presentation from colleagues from the Moors for The Future Project, who'll be giving us the lowdown on the scientific work behind the Project, Europe's largest of its kind, which is already transforming our local moors. It's sure to be an uplifting occasion, practical work with obvious and concrete benefits. Join us and be enthused! It's free and open to all. Posters are now out and about advertising the event. 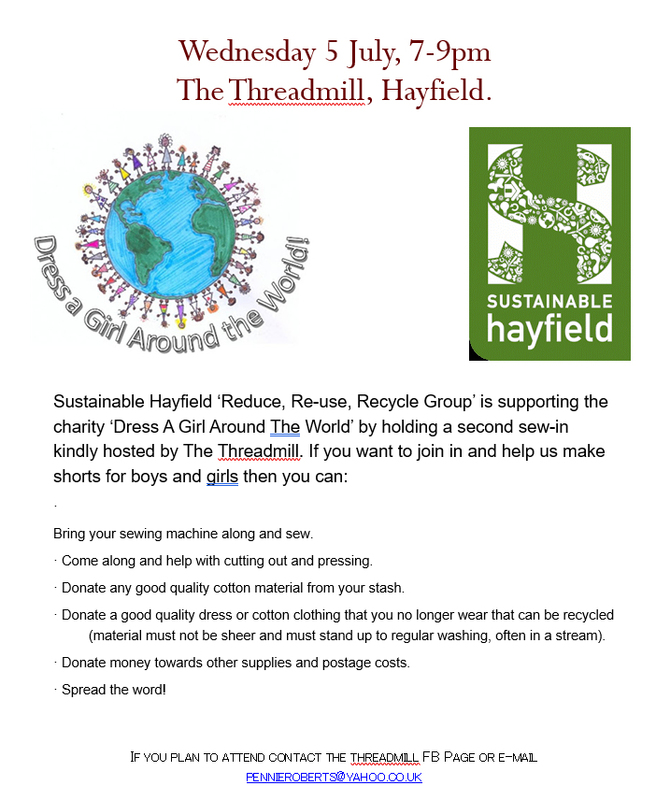 this Wednesday, 5th July, our Recycle and Re-Use group are joining forces with The Threadmill at Bank Vale Mill for another 'sew-in' in support of the charity Dress A Girl Around The World, on this occasion to make enough dresses for girls, and shorts for boys, to send to communities in impoverished countries. The action starts at 7.00p.m., and should go through to 9.00p.m. There's a range of ways you can help - from sewing through donating good quality cotton material, dress or clothing you no longer need tor donating money towards supplies and postage costs. The details are on the attached poster. If you plan to attend, that's great - please let The Threadmill know via its Facebook page or email Pennie Roberts at pennieroberts@yahoo.co.uk. Thanks! on Saturday, 15th July, our Food group is holding a family session at the library garden from 11.00 - 1.00pm. The session will involve some fruit picking - mainly blackcurrants and raspberries - and we are going to have a few recipe sheets and do some children's activities. Everyone welcome! on Thursday, 20th July, from 7.30p.m., a real treat awaits you at The Royal Hotel. We're having our AGM, which usually lasts around 20-25 minutes, and we're following this with what is sure to be both a very informative and uplifting talk from Joe Margetts and Tom Aspinall from the Moors For the Future project on the underpinning science behind all the work they've been doing to conserve our local South Pennine Moors, in what's the biggest moorland conservation project in Europe (they're the ones with helicopters delivering lime and seeds to the uplands), and the amazing impact this is already having on the health of the local peat blanket. Entitled 'Carbon, Climate, Water and Wildlife - the Scientific Work to combat the Catastrophe of Bare Peat', the talk will provide illustrations of the vital importance of our local peat bogs - which store the bulk of the UK's land-based carbon - and whose steady degradation over 200 years has meant increased carbon emissions, reduced water retention, increased risk of flooding, and diminished wildlife. This is all being reversed by this inspirational project......the moors are starting to flourish again.........and we're getting the chance to learn about the scientific basis of the work. Make sure you get a seat!